Do you remember the magic time of being a little child where the world was made up of everything imaginary. When everything you did was your best attempt to imitate the real world. Grown ups were so important and you just couldn’t wait to join them! Oh what happy times those were! Where Can I Find A Real Looking Baby Doll? I doubt that you will find one in your local store. At least in my town that would be a tough luck. But luckily we have the internet to save us. Since I love these gorgeous dolls so much I did some research: I checked which realistic baby dolls people loved most, what were they most used for, for what occasions they were bought and below I will present to you the best selection of baby doll that look real and cry. I must admit I enjoyed this research very much! If you have a baby girl who wants a doll that resembles a real baby and can drink and cry then this baby Annabell doll is like made for it. It’s an amazing baby doll that I believe every little girl can only hope to get. First of all you need to know that there are many versions of this baby doll and I have picked the one that has the features that you are looking for: it looks real and can cry. Another thing I like about this baby doll is that it has the right height: 46 cm. So very much like a real baby and when your girl plays with it she will have the feeling of having a real baby to take care of. She can make sounds just like a real baby: she gurgles, burps and babbles. As you can see from the image above the doll comes with a bottle that she really drinks from. The best thing about it is that her mouth really moves when she drinks from her bottle. How cute is that? I have never had such a doll when I was growing up but even as an adult I feel excited thinking about how wonderful it must be to play with this kind of a doll. If you lay down this doll and touch her cheeks she will yawn. So cute! This baby doll can cry real tears. Exactly what you are looking for and besides the crying sounds you will get real tears falling on her little face. In addition to all of the above the baby can have a tummy ache after feeding and she needs padding on her back to burp. Just like a real baby. 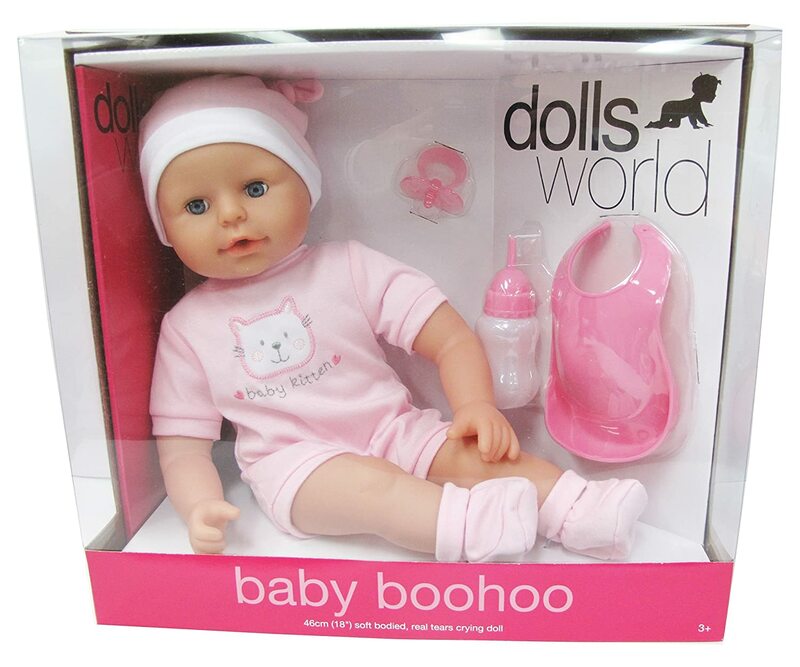 Overall it’s an amazing realistic baby doll that your child will adore and will have so much fun playing with. It is especially great to be given as a gift for birthday or Christmas as it is not very cheap but fits perfectly as a gift for bigger occasions. It is a precious toy for every little girl and will all the given possibilities you should really consider giving such a great doll to your girl. It will be a toy that she will remember when she grows up – how can she not, it’s truly an amazing baby doll. Even I, as a grown up, would be happy if someone gave me this doll – if for nothing else then for the extremely cute look (it does sound a bit weird I admit it 🙂 ). If you are wondering if there is a baby doll that can cry, blink, drink, move and look realistic then this is the perfect choice for you. This doll is truly a full package – it can do almost all the things that a real baby would do. This doll is very suitable for little girls growing up and learning some parenting lessons through game. The best part of this teaching is that for a child it actually doesn’t feel like teaching – it all comes very naturally. Children learn best through games and one of those games that nature has built in us is learning how to become like like the grown ups when we are young. That is why children imitate adults, they learn best through practicing and repeating what their parents are doing. Having a doll like baby born makes this learning process much more fun and much more realistic, preparing a young girl better for her later role in life. Besides the lifelike functions you will get this doll with 10 additional accessories: one of them is a potty. It can be used for potty training games where the doll wets in the potty- this surely is a rare feature among dolls. When I was a little child I loved most my dolls that could open and close their eyes. I would shake their head up and down and atch their eyes work their magic. I especially loved the ones with long eyelashes. So from my own experience the fact that this doll can open and close its eyes will make any girl a happy girl to have such a doll. In addition to this I hated when one eye would get stuck while the other worked perfectly – the doll had to be repaired right away! What good is a baby doll that can not bathe? It was a big NO NO in my child’s world. A bathable baby doll is almost a must have feature – unless the doll has some other specialties. So this feature is checked with this doll. A doll and water – true heaven for a child! You may have to use some force to separate water for your kid and it doll. So fun guaranteed here too. Be warned though – a customer said that the baby’s arms and legs do not move on her own, I guess they are only movable. But it is still an amazing doll with great realistic baby functions. Overall this doll toy has very high ratings, people and their children have been very satisfied. 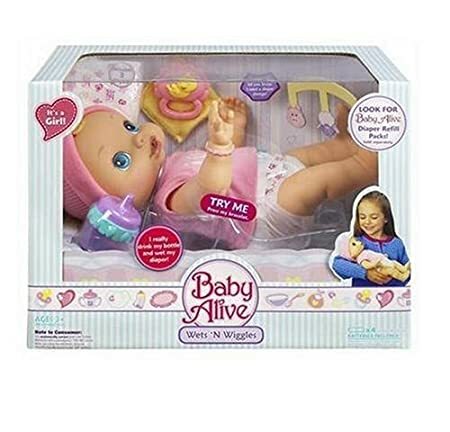 This Baby Alive doll is in the top 3 choices for baby dolls that look real and cry. I say this because the crying is actually for a reason: it means the baby has wet herself and needs changing. How much more realistic can it get? Not much, if any, if you ask me. After feeding it will wet the diapers. It will come with 3 doll diapers. This really amazes me, how far did the manufacturers go to make a doll look like a real life baby. This is the part where the main thing comes: when the baby is wet and it’s time for changing the diapers it will cry and ask for attention. Your kid should watch when changing the diapers as like a real baby it can wet her mommy. Fun when playing with this doll – I bet you and your kid will laugh when it happens. This baby alive doll has a bracelet on her arm, which when squeezed will make the baby coo and babble. The more I write about this doll the more I wish I had a doll like that when I was growing up. All the fun it will bring to a little girl! This is a doll that will make her mommy so proud to have. The only thing I don’t really like is that the diapers should be refilled – talking about a doll imitating a real baby… But you can make some cloth diapers or find cloth diapers for sale online and this problem can be easily solved. I also looked at how buyers were satisfied with purchasing this doll and this product has really high ratings. Parents liked the doll, their kids loved playing with it. So if you have any doubts about the quality of the Baby Alive Wets ‘N Wiggles Doll this should convince you that it is a good doll to get your baby girl. There are more versions of these dolls and you can do some searching to check them out, but honestly I believe the choices presented here are perfect if you are looking for real lifelike baby dolls that cry. They are fantasy dolls for every little girl, fun to play with and great for learning parenting lessons. If you are looking for a baby doll that can cry real tears and be on a budget then this you need to seriously consider this one. I mean for the price you can’t go wrong. And you have to admit that it looks adorable. A lovely gift for a lovely little girl to play with :). In case you haven’t found something you like on this page click here to check out these gorgeous life like baby dolls. A childhood is filled with the innocence that only children have, when the world was a good place full of love and bad things never happened. And if something got broken it could be fixed just by you wanting it. And the best of it all is that in that small world you controlled everything: it was a world that you created and it was only your will in it. I remember I could be whatever I wanted: a doctor and a mom and a writer were the things I played most often. I loved all those roles and I could play them over and over again. Never got tired of repeating them. And of course for all those games I needed accessories. Even though it is an imaginary world a child still needs the appropriate toys to play with. And some toys were so perfect that I still remember them, they are just part of my childhood and are forever part of my life. One of those perfect toys are baby dolls that look real and act real. For a little girl, imitating her mom and playing a mom of her own, a real lifelike baby doll is something truly precious. It can become a toy that a child could be with most of the time. A child can sleep with such a doll, have breakfast with her, feed her, dress her, take her out for walks. And since the baby doll looks real and does many things that real babies do that ongoing game really becomes very realistic and the child can learn so much during the game. Not to say that most likely that she will remember this toy – that is the impression such a realistic baby doll can leave on a little girl. A baby doll that looks real and cries will make your child jump through the roof out of happiness. Small children have strong feelings and they feel everything much more intense as most things are new to them, that a gift like that will have such an effect. It’s a dream toy for a little girl. And check this out: these realistic baby dolls are so adorable and so lifelike that even adults buy them! They are simply irresistible. 1 Where Can I Find A Real Looking Baby Doll?